More 2 star chefs here. Other French chefs here. Situated between Blois and Chambord, Christophe Hay and Emmanuelle Hay welcome you for a unique culinary experience. 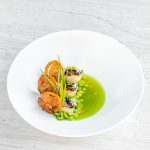 Within this gourmet restaurant Christophe Hay honors the Loire’s native products and the people who produce them to offer you a cuisine culturally rich and intentionally simple in an atmosphere decisively modern. 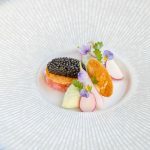 At his one star Michelin table between Blois and Chambord, Christophe Hay gives an intuitive cuisine around the Loire products and his own garden. In 2014, Christophe’s back to his native’s region with the purchase of La Maison d’à Côté. The chef proposed an inventive cuisine, modern and healthy by selecting local products exclusively. After 9 months opening, he was awarded with one star Michelin. 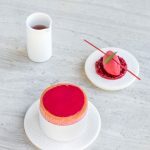 Today, he can add his one star Michelin with 3 toques at Gault Millau and the title of master cook , he have been elected « grand de demain » in 2016 by GaultMillau. Christophe Hay work essentially with local producers, anchored in the Ligérien’s country: Loire River’s fishes by his own fisher Sylvain Arnoult, poultries from Michel Angier, Wagyu beef from Thierry Roussel, goat cheeses from Dominique Fabre more again with his own vegetable garden a few meters away from his kitchen. The chef Christophe HAY, is a principal member of chef’s ecology association named “L’R durable”, which aims at pro noting a more responsible cooking way. Paul Bocuse et Éric Reithler are both his mentor in cooking. 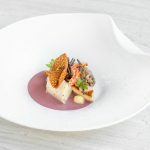 Christophe’s selected the best Loire Valley products on both tasting menus proposed à la carte, you can discover many dishes on 5 or 7 courses. 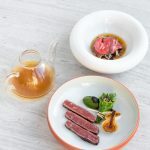 He brings a particular requirement to the welcome of his guests, taking the orders at each tables, to share a moment of conviviality with him and all his team. Opened as a lounge space where to welcome dinner guests of choice, plays on dark tints and cozy atmosphere. Raw woods confront with the metal, with the velvet of seats and offer to his beautiful kitchen a space of work and unique sharing. Of main entrance to flood and brass come to intimate this so necessary space and opens on the bright room. Here, the very aquatic carpet, as a wink of eye in the Loire River important to Christophe, bring heat and comfort. Almost spotless wallpaper (Elitis Pleats) is of use as cases to Charlotte Payen’s very beautiful drawings which worked on the quite close castles and their architecture. A very nice contemporary cellar, as a storeroom in a glass box, a throne in the room and invites in the tasting. 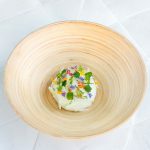 Since the Michelin Guide 2019, Christophe Hay is awarded 2 stars. More 2 star chefs here. Other French chefs here. Go back home.